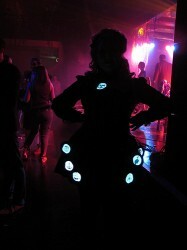 Whenever you go to MakerFaire, Dorkbot London meetings, OpenTech, you will be very unlucky not to meet Rain Ashford. Rain is the prime example of a Maker – using technology to fulfil her creative talent, sharing her knowledge, boosting people’s confidence. She always has time to help – she took time to answer my questions. At university, I studied Fine Art, followed by Multimedia. After university I moved to London and after a few months working at a digital agency, I took a post at the BBC, where I stayed for 11 years. When did you start playing with electronics? 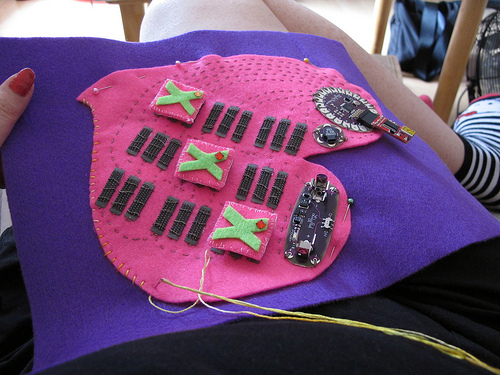 I initially experimented with pulling computers and peripherals apart at a women run technology initiative called Genderchangers that visited Limehouse Town Hall (home of dorkbot London) in about 2002, but discovered microcontrollers in 2008 when a friend gave me an Arduino to play with. After some small and joyous success playing with code, a breadboard and LEDs, I began to look at what else I could do with this technology. 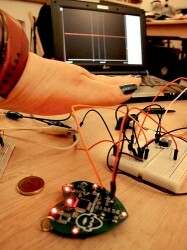 This led me to experiment with the mbed and then the sewable LilyPad Arduino microcontrollers. You held several positions at the BBC. What were they? I worked my way up from Web Assistant to Senior Producer, working on many of the BBC’s high profile websites, interactive activities and campaigns, from educational areas such as Arts and Learning, to live TV websites Watchdog and Crimewatch, and also Entertainment sites. I also worked for BBC R&D as a Technologist, co-running BBC Backstage, which was the BBC’s initiative to open up content, plus it was also a platform and community for developers both inside and outside the BBC. Whilst at R&D I also worked on RDTV, a groundbreaking project which piloted a series of technology interviews, but also released all the components of the interviews, such as the rushes, graphics and scripts to the public to remix. Which position(s) influenced you most and made you what you are now? I’m a mix of the various attributes from each of the roles I have had, for example, my ‘producer’ side is adept at organising, strategy and project management, where as my ‘technologist’ side is geeky, creative and considers technical aspects of my projects. I understand that you have gone back to college – can you tell us about the course? I’m doing a 1-year electronics engineering course, plus a course in C programming. I’m doing these to help me build, code and test bigger and better wearable technology and artworks. I’m learning loads and really enjoying being back in education. 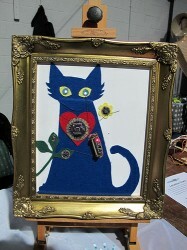 At Maker Faire and OpenTech you displayed and created great things with electronics and diverse materials. What do you do with these pieces? Do you sell them? 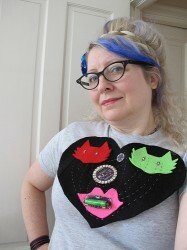 I’m building up my portfolio, so have been keeping my most recent wearable technology and electronic artworks for exhibitions and talks, but I’m also available for commission to make bespoke pieces and tech consultancy. Throughout the world, we can see more and more hackspaces, dorkbots etc. What do you think created that movement? What needs do they fulfil? Well, dorkbot London (whose tag line “doing strange things with electricity” says it all) has been a lynchpin and inspiration to my geekery for nearly 10 years now. I feel communities such as Hackspaces are growing out of frustration against technology companies creating products that are ever more closed and locked down to their users, plus tech that has a short or throwaway life expectancy before the next upgrade comes out. People from various backgrounds and experience of arts, crafts and sciences are setting up spaces so that they can have access to decent machines and tools, and also to share skills and ideas. People are also experimenting with open source ideals, helping each other and experimenting with different mediums in new ways – the plethora of online communities and inventors creating affordable technologies for many to enjoy has brought various communities together to create some fantastic projects. What do you think is the spirit of the Maker community? I think it’s sharing knowledge and having fun making stuff as a community. The Makers are the same people who attend the Hackspaces, Hackdays and dorkbots around the globe – people are very friendly, helpful and willing to share – there is a lot of crossover between the various communities and events. Unfortunately, we all have to earn a living can your creations be enough to do so? I’d like to hope so, but we’ll see. I do believe that wearable technology is the future – as ubiquitous computing gets smaller and converges with other lifestyle, medical and entertainment technologies, I think we’ll soon be getting used to it literally creeping into our clothes and I want to be one of the engineers designing and making this technology! How do you see the future and in particular your future? I see my future as less corporate and more fun! But as I mentioned above, I am putting my money on wearable technology and e-textiles becoming an essential part of the future. In terms of how, I feel that this could be by sensoring and monitoring technology getting smaller and more comfortable to wear with everyday garments, such as underwear, skirts, trousers, tops, etc and also advances in e-textiles. Uses for wearable technology are multiple, from sports, medical, lifestyle and vocational wear. An example of this could be simple, but reliable sensors that feedback medical data. For those who need their health monitoring, a non-invasive solution could give people independence from hospitals so that they could live at home or take holidays, with the reassurance of knowing that their doctors or carers will be able to keep track of their health remotely. Another big area for wearable tech is sports and personal tracking, where athletes, coaches and the viewing audience want precise performance data and also live images and sounds of an experience or event as it’s happening. 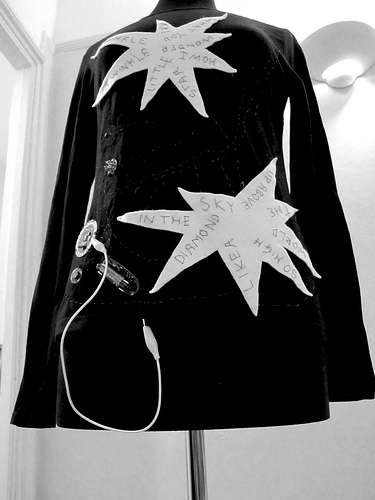 In performance, many theatre and dance productions are using tech in their costumes already, for example Lady Gaga is a prolific user. Space, military and the needs of those working in extreme environments are also pushing the development of wearable technology.